Oh, and here are Yui’s new headphones. They say Sony on the side but since they come from a Chinese store… yeah, they’re not really Sony xD. However, they are real headphones. You can connect them to an audio jack and they’ll play music for your dollfie! 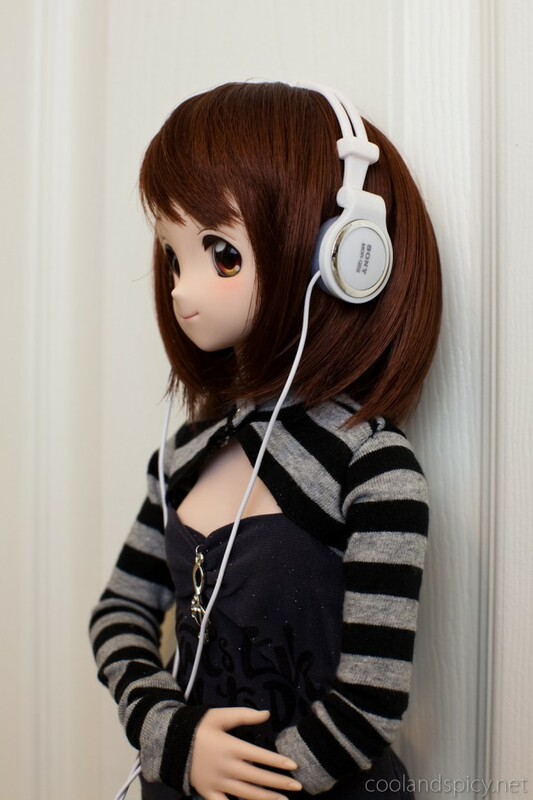 Yui listening to some Houkago Tea Time recordings ^^. Yui looks cute in these, she looked great with the blond wig but in her original appearance she’s just… more Yui, more herself so to speak. Hadn’t noticed the shoes yet, they do look fab. The headphones REALLY pull the whole outfit together! I really like them. The shoes/socks are cute too. nicely done, didnt see it. btw i think the headphones will suit mio better then yui but still it looks nice! Im amazed that they actually work as well, thats such an awesome touch! .-= TAKET0MB0´s last post… Scaredy Cat =-. Her skirt is really very awesome. I love it. I like the headphones too. Everything’s so delicately detailed. 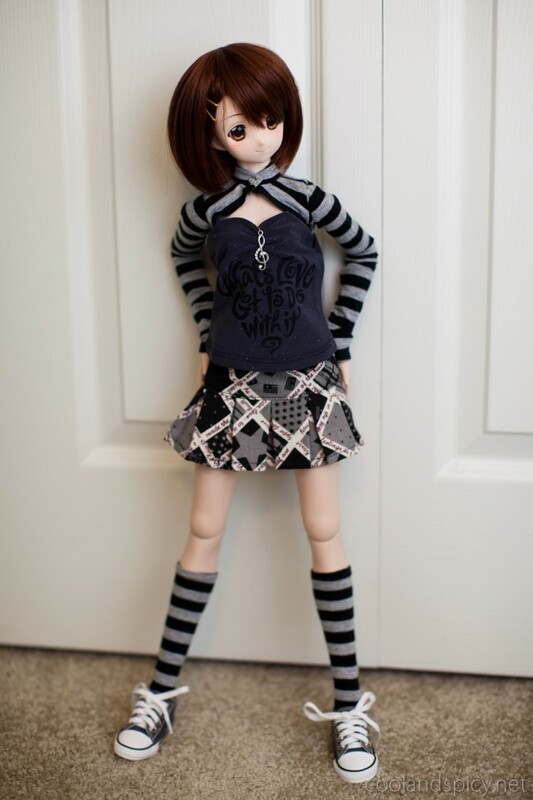 I gotta admit do m shame that im really amazed at the quality thats put into the clothes of dollfies. These dont look like clothes for dolls anymore but like clothes for tiny people. 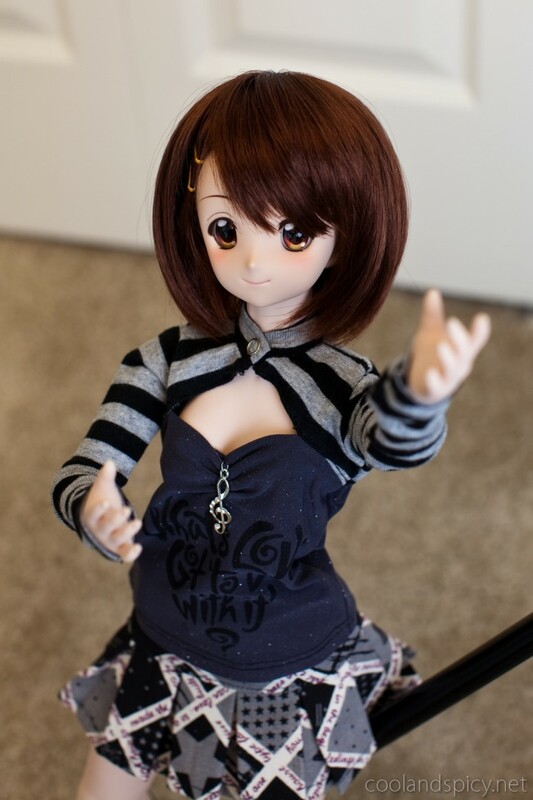 .-= Blowfish´s last post… 1/7 Sonsaku Hakufu Changing Clothes Ver. =-. You got that right sir, they are not doll anymore! These are clothes for our 1/3 scaled daughters! Wait, the headphones actually work? That’s awesome! That’d offset not being really Sony any day. This outfit is my cup of tea; black, grey and knee socks, miniskirt, long-sleeves, revealing just the right amount. Excellente. Also, the first and third shots are PRO. .-= Ningyo´s last post… I Did Not Just Disappear for A Whole Week. It was An Illusion. =-. Wow, I did not realize those are real headphone! That’s really something! Can we ask where you ordered the headphones from?